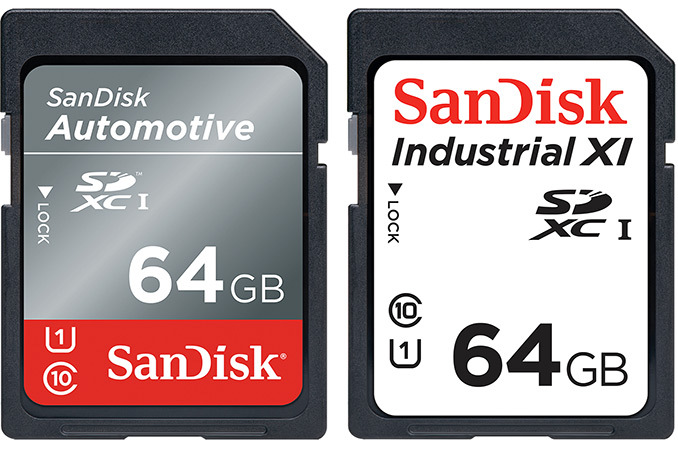 Western Digital has introduced its new SanDisk Automotive and SanDisk Industrial memory cards for specialized applications. The new cards can work in extreme temperatures for prolonged amounts of time, integrate health status monitor capability, special data retention mechanisms, and some are compliant with the AEC-Q100 Grade 3 standard. In addition, the cards are substantially faster than their predecessors are, thus enabling Western Digital to offer them for emerging applications, such as surveying commercial drones and automotive dash cameras. Western Digital’s new family of cards for specialized application consists of four lineups each offering slightly different features. The SanDisk Automotive devices are aimed at cars, drones and other vehicles, they come in SD form-factor in capacities from 8 to 64 GB and they are compliant with the AEC-Q100 Grade 3 requirements, and can operate in extreme temperatures between -40ºC and 85ºC for prolonged amounts of time. The SanDisk Industrial cards for “mainstream” industrial applications come in SD (8 – 64 GB) and microSD (8 – 128 GB) form-factors, are rated for up to 192 TBW (the manufacturer does not disclose which drives can survive 192 TB, but it is likely that it means the 64 GB and/or 128 GB versions) and are guaranteed to work for extended amounts of time in “mildly” extreme temperatures from -25ºC to 85ºC. For machines that are going to work at -40ºC, SanDisk offers the Industrial XI range. When it comes to performance, the cards feature a sequential read speed of up to 80 MB/s and a sequential write speed of 50 MB/s. This is a significant performance boost over previous-gen SD cards for automotive and industrial applications that had throughput of 20 MB/s. Western Digital does not disclose much about technologies behind the new SanDisk Automotive and SanDisk Industrial cards, but given extended temperature ranges, we are talking about NAND flash memory and controllers produced using appropriate process technologies. Speaking of the controller, this one supports a number of technologies developed exclusively for SanDisk’s latest memory cards for automotive and industrial applications. Health Status Monitor Expanded reporting capabilities enable manufacturers to remotely monitor usage of the card and identify when card upgrades or replacements are needed. First off, the new cards support the Health Status Monitor feature, which enables OEMs to monitor capacity usage, performance levels and some other factors. The features relies on the suggested SD spec; it works with the host system and thus requires the latter to support it. To ensure maximum reliability and data integrity, the new SanDisk cards support the Read Refresh feature. This techique automatically manages various situations and refreshes data as needed to help ensure data integrity and accurate performance even in circumstances where data has not been accessed for very long periods of time. As well, it protects against “read disturbances” which are interferences from neighboring read-intensive cells. The algorithm is completely proprietary and is not a part of the SD specification. This technology works automatically on all cards and does not require support from the host. Finally, the cards support the Host Lock capability, which enables customers to set up passwords for their cards and prevent them from reading on non-native hosts. 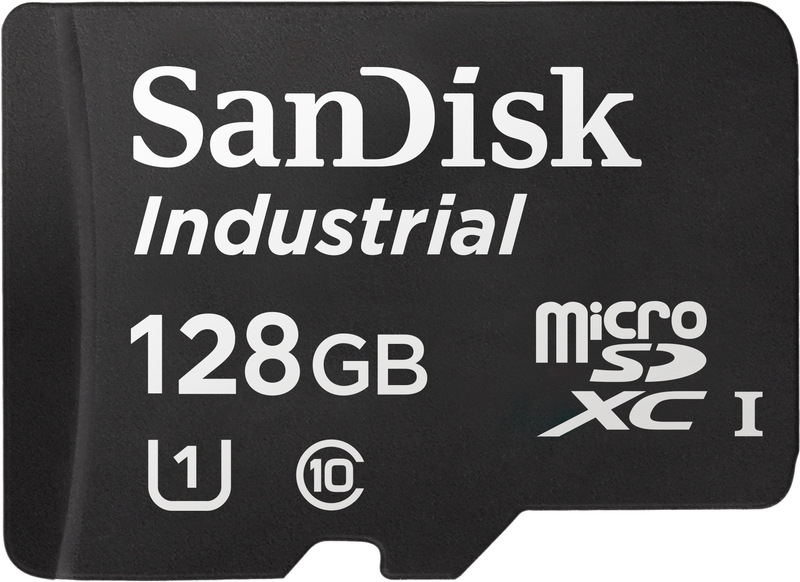 Western Digital says that the SanDisk Industrial SD and microSD cards, as well as the SanDisk Automotive SD cards are now sampling to OEMs worldwide. The company cannot disclose when its partners plan to use the cards in their products, but industrial and automotive tests are thorough, take a long time and life cycles of appropriate applications depend on multiple things in addition to memory cards. Meanwhile, samples of the SanDisk Industrial Extended Temperature SD cards will be available in October. Is that -40C or -40F? (ha ha). I'm not sure if this is in use inside your Ford or Chevy, or for a consumer to put into the slot on their radio (in lieu of a CD-player). If the latter, I expect people to put a card in and leave it for months, until their music tastes change. Company is put out heart and soul to develop the cards to work in such conditions and no other company has still achieved . If there is some errors you can correct them in friendly manner.We can ready to accept it. Not by pinpointing it.We are working for you guys.If you can't able to encourage its up to you. Please don't discourage. There is lot of efforts behind these works. It is a great place to work around in such environment with extremely skilled persons . Don't get offended by these message. I have just shared my thoughts.